Third Floor Lobby, Foundation Building. The main spaces of the School of Architecture are housed primarily on the second, third and seventh floors of the Foundation Building, a National Historic Landmark widely referred to as one of New York City’s great monuments. When The Cooper Union opened in New York City in 1859, the physical structure of the original building closely followed Peter Cooper’s educational philosophy. The five-story Foundation Building was designed by Frederick A. Petersen in the Renaissance Revival style, with studios and classrooms above a first floor of stores open to the public. In 1890, Leopold Cyrus W. Eidlitz added studio skylights and additional floors to the building. The building exemplified not only Peter Cooper’s dedication to social mobility through education, but his recognition of the power of technology and the importance of art and design. The tallest building in New York City in 1859, this first “skyscraper” was also the first building to be designed with a rolled iron I-beam infrastructure and the first to house an elevator shaft top to bottom, although the passenger car and conveyance system for such a shaft had not yet been developed. In 1974, John Q. Hejduk, the first Dean of the School of Architecture, completely redesigned the interior of the Foundation Building, aligning the program of the building with the pedagogy of the schools, while leaving the exterior largely unchanged. In the words of Ada Louise Huxtable, the renovation was “the best of both worlds,” with the “‘Renaissance shell intact” and the “clarity and detail of the consciously sophisticated modernism of the interior” attesting to “the creative continuity of history and art.” The brownstone exterior of the Foundation Building was extensively restored under the direction of Platt Byard Dovell between 1999 and 2002. All students in the School of Architecture are provided workspace on the third floor within a shared studio. With the first through fourth years sharing a single large studio and the fifth-year thesis class and graduate students in smaller studio spaces, a unique environment fostering cross-fertilization between classes and individual students is maintained. Students are provided with individual studio workspace with individual and shared tables for drawing, study, reference, model building, etc. For the health and well-being of students, the school does not support the principle or practice of continual 24-hour studio access. Studios are generally open Monday–Thursday 7:30 am–2 am, Friday 7:30 am–midnight, Saturday 8 am–midnight, and Sunday noon–2 am. The School of Architecture Computer Studio on the seventh floor of the Foundation Building is specifically intended to support a design curriculum that recognizes the use of computing as an instrument of investigation and practice and which urges students to explore its formal and cultural implications. The facility utilizes both Macintosh and Dell Precision PCs (including high-end multiple-processor rendering stations), scanning and printing capabilities and two large-format plotters. Software includes an array of imaging, drawing, drafting and 3D modeling and rendering programs. This facility is open to all students of The Cooper Union. Considered integral to the activities of the design studio, the computer studio is generally open whenever the design studios are open, giving students access an average of 17 hours a day. A student monitor trained to assist in the effective use of the facility and to do simple troubleshooting on the hardware is present whenever the center is open. The School of Architecture Computer Studio also supports a 3D printer and laser-cutter; other three-dimensional output capabilities in The Cooper Union include a laser-cutter in the School of Art and CNC and rapid prototype machines in the School of Engineering. Computing facilities designed to serve the specific needs of the Schools of Art and Engineering are open for use by students of the School of Architecture. A small auditorium on the third floor is used for lecture classes and invited lecturers. Special lectures are open to all interested Cooper Union students. An outstanding all-college sculpture shop is located on the fourth floor. Integral to both the program and pedagogy of the School of Architecture, the art and architecture shop is equipped for projects in wood, metal, plastics, plaster and clay, and includes a bronze casting foundry. For a complete description of the shop facility, please refer to the School of Art section (page 56). The School of Architecture has fostered the growth of a non-circulating Study Collection of books and periodicals that are not otherwise accessible through the Cooper Union library system, sometimes including rare or limited edition items, often on loan from private collections. Students make use of the room for quiet reading and study. The room is also used for seminar classes and meetings. 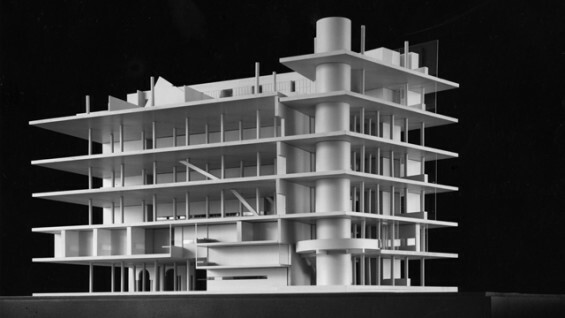 The School of Architecture Archive is responsible for the ongoing collection, documentation and storage of student work, and now has a record of student work produced at the school since the 1930s. This provides an invaluable record of the pedagogy of the school that can be used for exhibitions, publications and student research. In addition, the Archive’s Blueprint Collection, Lantern Slides, New York Postcard Collection, Stanley Prowler Slide Collection, New York City Waterfront Archive, Limited Edition Books and rare books are resources available for use by students and faculty for research and study. The Archive also manages the loan of analog and digital video cameras as well as other photographic equipment for student use on class projects. Named for Arthur A. Houghton Jr., former trustee and chairman of The Cooper Union, this 1800 square-foot gallery supports the pedagogy of the School of Architecture through public exhibitions and events. Over the years, the works of architects, photographers, painters, builders and faculty and students of the school have been exhibited, drawing viewers from schools of architecture and the wider professional communities as well as the public at large. The School of Architecture Archive works with other institutions to present jointly sponsored exhibitions, or will curate, design and install original exhibitions. Recent exhibitions presented by the school include Drawing from the Archive: Analysis as Design (with additional support from the Graham Foundation for Advanced Studies in the Fine Arts), Drawing Ambience: Alvin Boyarsky and the Architectural Association ( co‑organized by Museum of Art Rhode Island School of Design, Providence and the Mildred Lane Kemper Art Museum at Washington University in St. Louis, with additional support from the Graham Foundation for Advanced Studies in the Fine Arts), Paul Rudolph: Lower Manhattan Expressway (presented with The Drawing Center, New York), Lessons from Modernism (presented with the Institute for Sustainable Design, with generous support from the Stavros Niarchos Foundation), Massimo Scolari: The Representation of Architecture, 1967-2012 (organized by the Yale School of Architecture with additional support provided by the Graham Foundation for Advanced Studies in the Fine Arts, the Turner Foundation, and by Elise Jaffe + Jeffrey Brown), Bernhard Hoesli: Collages, Alternativas/Alternatives XIII Spanish Biennial of Architecture and Urbanism (co-presented with the Spanish Biennial of Architecture and Urbanism and presented in association with Archtober, Architecture and Design Month New York City, October 2016) and John Hejduk Works/Jan Palach Memorial (installation presented in conjunction with the New York City Department of Transportation's Arterventions Program). In September 2009, The Cooper Union opened its first new academic building in fifty years at 41 Cooper Square, opposite the landmark Foundation Building. This building houses the School of Engineering and the Faculty of Humanities and Social Sciences, studios for the School of Art, classrooms and computing studios for all students, and a shared gallery and auditorium. 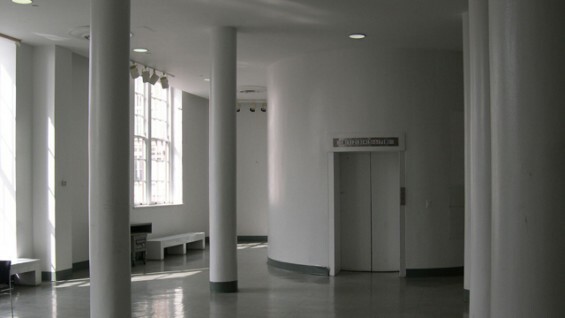 The first academic building to achieve the LEED Platinum status, 41 Cooper Square provides all students of The Cooper Union with access to state-of-the-art tools to pursue creative and original research and design in the course of their learning. The School of Architecture Computer Studio as well as the Cooper Union Computer Center at 41 Cooper Square are open to all architecture students and are equipped with all of the hardware and software necessary for their work and study. We recommend that students who wish to purchase their own laptop computers complete their first year of study before making a purchase in order to fully test a range of programs and platforms. Current students have selected a variety of laptop models in both Mac and PC platforms for individual use. The Cooper Union assumes no liability for personal laptops. Students who use/bring their personal laptops to school are solely responsible for the safety and security of their equipment and are strongly advised to secure their laptops in their lockers when not in use. Each new student is assigned a Cooper Union email address during Orientation. It is the responsibility of all students to actively and regularly check and use their Cooper Union email in order to receive, in a timely manner, official school announcements, important information about registration, messages of general interest about events, exhibitions and programs, safety updates, policy notifications, etc. As The Cooper Union continues its transition to an online administrative system, linked solely to The Cooper Union email address, this line of communication becomes even more vital. In addition, wireless internet access is available throughout The Cooper Union and can only be accessed via a Cooper Union email address and password.